So... I spent some time writing and converting the baseball game for the BBS. Now I have another itch--- An XB Adventure game which does not require the Adventure module... Primarily to run on the BBSes as well. Here's the plan: Come up with the premise, collect input from the members here on Atariage, write the game for the BBS, then get the "go-ahead" from the SysOp(s) to add it to the BBS as a playable door game. I had started work on a Beryl Reichardt adventure game, but scrapped it when I realized how inefficient the code was... I was able to read a book on Planet-99 which gave some very interesting insights into the development of the Adventure games and it really got me going! The methods described there are fascinatingly simple and straight forward and allow for a TON of stuff to be coded in with minimal duplicate code and minimal program space. Using a string variable array and TWO standard variable arrays is the key to having your map laid out AND having the ability to stock your world with the items you'll need to design the quest as you see fit. Is anyone interested in participating in this development project? I will not be starting it immediately, as I have some pressing matters at hand writing some music and working with a couple suites... (ASLP by Hully and XB256 by Harry)... I would say that in the next week or two I will be returning my attention to this project. I just got my PEB set back up tonight and I'm picking up a monitor on Sunday, so I'll be hardware-active again this weekend.... WOOO HOOOO!!!!! That's an exciting thing for me. I'm always interested in support roles, and adventures interest me as well. As for the design, there are many ways to layout the data, and many ways you can accept input. I think a minimal system would not take a noun-verb pair, but rather just allow the user a fixed set of commands like N, S, E, W, Up, Down, Look, Take, Drop, and Use. The "maze" would be limited to those directions, and your inventory would be limited to one item so using an item is obvious. Once you start to want more features, the complexity goes up. Also, since adventures are typically based on stories and individual logic puzzles that unlock other puzzles, the games are typically designed as "engines" instead of hard-coded logic for each puzzle and possibility. Also, the line between hard-coded logic and an engine is very thin, and it does not take adding many features to realize a hard-coded logic solution is not going to work. As with any project, it is best to define the desired features and goals without trying to specify how the solution will be coded. Once you have the scope defined, then start to determine the coding methodology and adjust the features from there. ...it does not take adding many features to realize a hard-coded logic solution is not going to work. I ran into this in my baseball simulation/game. For a simulation, hard coded logic works great... Once it became a "game" with significant user input, that concept fell apart and I had to adjust quite a few elements in order to facilitate the changes in design. Any thoughts and ideas you've got, feel free to tack em onto this thread so we can start thinking about structure. When I wrote Murder Motel (online, 25 player BBS game) I used an array to define the possible directions and the room each direction would lead to, 0 indicating an unavailable direction. I handled inventory and user locations via a string. Each item or person is represented by its position in the string, as one character, which then tells the program where it resides or who is its owner. This was important to conserve space and to quickly identify items in a room. Using POS and SEG$, one can fairly quickly loop through the matching items without needing to test every data element. Strings also provide for quick and moderately efficient storage to disk, important for saving the game state in a multi-player game but perhaps less important for single user adventures. Common commands like Inventory, Map, Quit are often easy to parse and execute as they are useable in any room. The complexity rises with your strategy and puzzle complexity. If you need to complete five steps in sequence, you need a method to track those steps to ensure the user does them in the right order. Defining the items (door) and verbs (eat) with their possible actions may be one good way to cut down on the parsing and action testing. Many of the XB games I have encountered are written with a basic parser that relies upon the actions and items being 3-4 unique characters long. Some require you to type the entire word or direction -- I usually avoid these games or modify them to accept shorter phrases The parsing is usually pretty easy to accomplish. Determining the actions based on what your parser finds is where your coding usually requires more effort. To paraphrase Matthew, knowing what you want to do and the scope of the game is a good first step. Edited by InsaneMultitasker, Sat May 11, 2013 12:26 PM. This is a nice little gem I found while cruising some BBSes last night. It would take minimal customization to port this to work on the TI and with some creative "find and replace" stuff, could run on Heat Wave or the Reef. Enjoy. 50  REM THAT VERSION WAS DESIGNED FOR THE CDC CYBER 70/73-26 RUNNING BASIC 3. 60  REM THIS VERSION HAS BEEN PORTED BACK TO HP TIME-SHARED BASIC. 80  REM DO TAKE NOTE OF HP TIME-SHARED BASIC'S IDIOSYNCRATIC "GOTO <VAR> OF"
150  REM  STATEMENT, USED IN PLACE OF THE "ON" STATEMENT OF MANY OTHER BASICS. 154  REM SOMEWHAT UNUSUALLY IN TIME-SHARED BASIC. 156  REM WILL CERTAINLY NEED TO BE CUSTOMIZED TO YOUR BASIC PLATFORM. 160  PRINT "DO YOU NEED INSTRUCTIONS (YES/NO)"
240  PRINT "THIS PROGRAM SIMULATES A TRIP OVER THE OREGON TRAIL FROM"
250  PRINT "INDEPENDENCE MISSOURI TO OREGON CITY, OREGON IN 1847." 260  PRINT "YOUR FAMILY OF FIVE WILL COVER THE 2040 MILE OREGON TRAIL"
270  PRINT "IN 5-6 MONTHS --- IF YOU MAKE IT ALIVE." 290  PRINT "YOU HAD SAVED $900 TO SPEND FOR THE TRIP, AND YOU'VE JUST"
300  PRINT "   PAID $200 FOR A WAGON." 310  PRINT "YOU WILL NEED TO SPEND THE REST OF YOUR MONEY ON THE"
320  PRINT "   FOLLOWING ITEMS:"
340  PRINT "     OXEN . YOU CAN SPEND $200-$300 ON YOUR TEAM"
350  PRINT "            THE MORE YOU SPEND, THE FASTER YOU'LL GO"
360  PRINT "               BECAUSE YOU'LL HAVE BETTER ANIMALS"
380  PRINT "     FOOD . THE MORE YOU HAVE, THE LESS CHANCE THERE"
390  PRINT "               IS OF GETTING SICK"
410  PRINT "     AMMUNITION - $1 BUYS A BELT OF 50 BULLETS"
420  PRINT "            YOU WILL NEED BULLETS FOR ATTACKS BY ANIMALS"
430  PRINT "               AND BANDITS, AND FOR HUNTING FOOD"
450  PRINT "     CLOTHING . THIS IS ESPECIALLY IMPORTANT FOR THE COLD"
460  PRINT "               WEATHER YOU WILL ENCOUNTER WHEN CROSSING"
470  PRINT "               THE MOUNTAINS"
490  PRINT "     MISCELLANEOUS SUPPLIES . THIS INCLUDES MEDICINE AND"
500  PRINT "               OTHER THINGS YOU WILL NEED FOR SICKNESS"
510  PRINT "               AND EMERGENCY REPAIRS"
540  PRINT "YOU CAN SPEND ALL YOUR MONEY BEFORE YOU START YOUR TRIP -"
550  PRINT "OR YOU CAN SAVE SOME OF YOUR CASH TO SPEND AT FORTS ALONG"
560  PRINT "THE WAY WHEN YOU RUN LOW. HOWEVER, ITEMS COST MORE AT"
570  PRINT "THE FORTS. YOU CAN ALSO GO HUNTING ALONG THE WAY TO GET"
590  PRINT "WHENEVER YOU HAVE TO USE YOUR TRUSTY RIFLE ALONG THE WAY,"
600  PRINT "YOU WILL BE TOLD TO TYPE IN A WORD (ONE THAT SOUNDS LIKE A"
610  PRINT "GUN SHOT). THE FASTER YOU TYPE IN THAT WORD AND HIT THE"
620  PRINT "**RETURN** KEY, THE BETTER LUCK YOU'LL HAVE WITH YOUR GUN." 640  PRINT "AT EACH TURN, ALL ITEMS ARE SHOWN IN DOLLAR AMOUNTS"
660  PRINT "WHEN ASKED TO ENTER MONEY AMOUNTS, DON'T USE A **$**." 710  PRINT "HOW GOOD A SHOT ARE YOU WITH YOUR RIFLE?" 720  PRINT "  (1) ACE MARKSMAN,  (2) GOOD SHOT,  (3) FAIR TO MIDDLIN'"
730  PRINT "         (4) NEED MORE PRACTICE,  (5) SHAKY KNEES"
740  PRINT "ENTER ONE OF THE ABOVE . THE BETTER YOU CLAIM YOU ARE, THE"
750  PRINT "FASTER YOU'LL HAVE TO BE WITH YOUR GUN TO BE SUCCESSFUL." 1150  PRINT "YOU OVERSPENT.YOU ONLY HAD $700 TO SPEND. BUY AGAIN"
1180  PRINT "AFTER ALL YOUR PURCHASES, YOU NOW HAVE ";T;" DOLLARS LEFT"
1200  PRINT "MONDAY MARCH 29 1847"
1690  PRINT "YOU HAVE BEEN ON THE TRAIL TOO LONG  ------"
1700  PRINT "YOUR FAMILY DIES IN THE FIRST BLIZZARD OF WINTER"
1840  PRINT "YOU'D BETTER DO SOME HUNTING OR BUY FOOD AND SOON!!!!" 1970  PRINT "DOCTOR'S BILL IS $20"
2020  PRINT "TOTAL MILEAGE IS 950"
2090  PRINT "OR (3) CONTINUE"
2170  PRINT "DO YOU WANT TO (1) HUNT, OR (2) CONTINUE"
2240  PRINT "TOUGH---YOU NEED MORE BULLETS TO GO HUNTING"
2290  PRINT "ENTER WHAT YOU WISH TO SPEND ON THE FOLLOWING"
2370  PRINT "YOU DON'T HAVE THAT MUCH -- KEEP YOUR SPENDING DOWN"
2550  PRINT "TOUGH---YOU NEED MORE BULLETS TO GO HUNTING"
2620  PRINT "NICE SHOT.RIGHT ON TARGET.GOOD EATIN' TONIGHT!!" 2660  PRINT "RIGHT BETWEEN THE EYES---YOU GOT A BIG ONE!!!!" 2670  PRINT "FULL BELLIES TONIGHT!" 2710  PRINT "YOU MISSED---AND YOUR DINNER GOT AWAY....."
2750  PRINT "DO YOU WANT TO EAT (1) POORLY  (2) MODERATELY"
2840  PRINT "YOU CAN'T EAT THAT WELL"
2970  PRINT "(1) RUN  (2) ATTACK  (3) CONTINUE  (4) CIRCLE WAGONS"
3150  PRINT "NICE SHOOTING---YOU DROVE THEM OFF"
3180  PRINT "LOUSY SHOT---YOU GOT KNIFED"
3200  PRINT "YOU HAVE TO SEE OL' DOC BLANCHARD"
3220  PRINT "KINDA SLOW WITH YOUR COLT .45"
3450  PRINT "THEY DID NOT ATTACK"
3480  PRINT "RIDERS WERE FRIENDLY, BUT CHECK FOR POSSIBLE LOSSES"
3500  PRINT "RIDERS WERE HOSTILE--CHECK FOR LOSSES"
3520  PRINT "YOU RAN OUT OF BULLETS AND GOT MASSACRED BY THE RIDERS"
3660  PRINT "WAGON BREAKS DOWN--LOSE TIME AND SUPPLIES FIXING IT"
3700  PRINT "OX INJURES LEG---SLOWS YOU DOWN REST OF TRIP"
3740  PRINT "BAD LUCK---YOUR DAUGHTER BROKE HER ARM"
3750  PRINT "YOU HAD TO STOP AND USE SUPPLIES TO MAKE A SLING"
3790  PRINT "OX WANDERS OFF---SPEND TIME LOOKING FOR IT"
3820  PRINT "YOUR SON GETS LOST---SPEND HALF THE DAY LOOKING FOR HIM"
3850  PRINT "UNSAFE WATER--LOSE TIME LOOKING FOR CLEAN SPRING"
3890  PRINT "HEAVY RAINS---TIME AND SUPPLIES LOST"
4000  PRINT "YOU RAN OUT OF BULLETS -- THEY GET LOTS OF CASH"
4040  PRINT "YOU GOT SHOT IN THE LEG AND THEY TOOK ONE OF YOUR OXEN"
4060  PRINT "BETTER HAVE A DOC LOOK AT YOUR WOUND"
4100  PRINT "QUICKEST DRAW OUTSIDE OF DODGE CITY!!!" 4110  PRINT "YOU GOT 'EM!" 4130  PRINT "THERE WAS A FIRE IN YOUR WAGON--FOOD AND SUPPLIES DAMAGE!" 4190  PRINT "LOSE YOUR WAY IN HEAVY FOG---TIME IS LOST"
4220  PRINT "YOU KILLED A POISONOUS SNAKE AFTER IT BIT YOU"
4260  PRINT "YOU DIE OF SNAKEBITE SINCE YOU HAVE NO MEDICINE"
4290  PRINT "YOUR WAGON GETS SWAMPED FORDING RIVER--LOSE FOOD AND CLOTHES"
4340  PRINT "WILD ANIMALS ATTACK!" 4370  PRINT "YOU WERE TOO LOW ON BULLETS--"
4380  PRINT "THE WOLVES OVERPOWERED YOU"
4420  PRINT "NICE SHOOTIN' PARDNER---THEY DIDN'T GET MUCH"
4440  PRINT "SLOW ON THE DRAW---THEY GOT AT YOUR FOOD AND CLOTHES"
4530  PRINT "HAVE ENOUGH CLOTHING TO KEEP WARM"
4560  PRINT "HAIL STORM---SUPPLIES DAMAGED"
4670  PRINT "HELPFUL INDIANS SHOW YOU WHERE TO FIND MORE FOOD"
4750  PRINT "YOU GOT LOST---LOSE VALUABLE TIME TRYING TO FIND TRAIL!" 4790  PRINT "WAGON DAMAGED!---LOSE TIME AND SUPPLIES"
4840  PRINT "THE GOING GETS SLOW"
4890  PRINT "YOU MADE IT SAFELY THROUGH SOUTH PASS--NO SNOW"
4970  PRINT "BLIZZARD IN MOUNTAIN PASS--TIME AND SUPPLIES LOST"
5060  PRINT "YOU RAN OUT OF FOOD AND STARVED TO DEATH"
5090  PRINT "YOU CAN'T AFFORD A DOCTOR"
5110  PRINT "YOU RAN OUT OF MEDICAL SUPPLIES"
5180  PRINT "DUE TO YOUR UNFORTUNATE SITUATION, THERE ARE A FEW"
5190  PRINT "FORMALITIES WE MUST GO THROUGH"
5210  PRINT "WOULD YOU LIKE A MINISTER?" 5230  PRINT "WOULD YOU LIKE A FANCY FUNERAL?" 5250  PRINT "WOULD YOU LIKE US TO INFORM YOUR NEXT OF KIN?" 5280  PRINT "BUT YOUR AUNT SADIE IN ST. LOUIS IS REALLY WORRIED ABOUT YOU"
5310  PRINT "THAT WILL BE $4.50 FOR THE TELEGRAPH CHARGE." 5330  PRINT "WE THANK YOU FOR THIS INFORMATION AND WE ARE SORRY YOU"
5340  PRINT "DIDN'T MAKE IT TO THE GREAT TERRITORY OF OREGON"
5350  PRINT "BETTER LUCK NEXT TIME"
5400  PRINT TAB(17);"THE OREGON CITY CHAMBER OF COMMERCE"
5470  PRINT "YOU FINALLY ARRIVED AT OREGON CITY"
5480  PRINT "AFTER 2040 LONG MILES---HOORAY!!!!!" 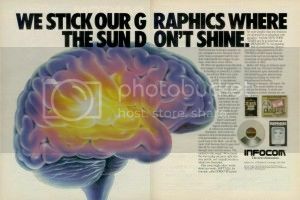 5490  PRINT "A REAL PIONEER!" 5720  PRINT "JULY ";D3;" 1847"
5760  PRINT "AUGUST ";D3;" 1847"
5800  PRINT "SEPTEMBER ";D3;" 1847"
5840  PRINT "OCTOBER ";D3;" 1847"
5880  PRINT "NOVEMBER ";D3;" 1847"
6060  PRINT TAB(11);"PRESIDENT JAMES K. POLK SENDS YOU HIS"
6090  PRINT TAB(11);"AND WISHES YOU A PROSERPOUS LIFE AHEAD"
6110  PRINT TAB(22);"AT YOUR NEW HOME"
6132  REM WILL VARY FROM SYSTEM TO SYSTEM. 6330  PRINT "YOU MUST STOP FOR MEDICAL ATTENTION"
6370  PRINT "MILD ILLNESS---MEDICINE USED"
6410  PRINT "BAD ILLNESS---MEDICINE USED"
6500  REM B1 = ACTUAL RESPONSE TIME FOR INPUTTING "BANG"
6510  REM B3 = CLOCK TIME START OF INPUTTING "BANG"
Text adventures can be implemented in a variety of ways in BASIC and Extended BASIC. One technique I read in an old Rainbow magazine (The TRS-80 Color Computer's magazine) was to store your noun/verb sets into very long strings. Then you use the POS function to immediately find out if the noun/verb exists in the vocabulary. If you're going with 4-character limits on noun/verb preciseness, you can just divide the returned position by 4 to indicate a verb/noun match. Great technique. Perhaps very useful together with an ON x GOTO or two. I recall one game that tested words via a loop (slow). What I liked was if the word or phrase was not found, the program displayed some random quip telling the user the request was not understood - in a comical fashion not unlike Infocom. 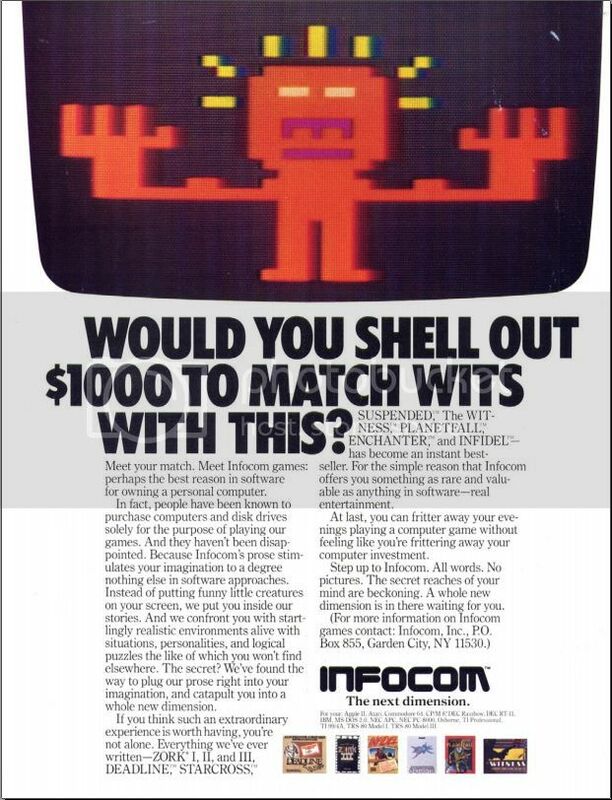 Ahh Infocom. Edited by Opry99er, Fri May 17, 2013 2:23 PM. LINES 6130 to 6280 specifically. The handling of the "shooting"
On my old game 'Stranger' (http://harmlesslion....ftware/stranger), I didn't use any kind of formal parser at all.. each 'scene' is at a different location in code and the parser just looks for keywords relevant to that area. It means that the input is pretty freeform (both verb/noun and full sentences tend to work as long as the words are present), but you wouldn't want to do a really large story that way. Remembering Infocom ... the parser even recognized object references, something like GET THE KEY AND UNLOCK THE DOOR WITH IT. I think there were different versions of the parser; the earlier ones were less powerful. I still have the original Zork II, III, and Deadline packages here. There were still a lot of games I always wanted to play but never got them. My absolute favorites were Planetfall and Stationfall. I can still remember the scenes, although they were in my head only. And, who of you did not hesitate to get the PC games Return to Zork, Zork Nemesis, and Zork Grand Inquisitor? The key to the game is the parsing engine... How does the user communicate with the computer to TELL IT WHAT HE/SHE WANTS TO DO?!?! Well, as we all know, a computer doesn't speak english, and we cannot possibly code in every possible command. Therefore, we create a parsing engine which takes a noun and a verb (two separate string variables INPUT from the user) and attempts to read those from a list of acceptable nouns and verbs in the system. For instance, "OPEN DOOR" contains a verb and a noun. A successful parsing engine would read the noun (to determine if that thing (the door) is in the vicinity) and IF that noun IS legal, read the verb (to determine if the selected action can be performed on the noun)... For instance, "EAT BREAD" is cool if you have bread in your inventory. "EAT DOOR" does not work, even if DOOR is in the current "room." I had some ideas that were working very well with an adventure game I started writing. Right from the start the environment was huge, which probably killed off the later enthusiasm because although everything was working as I hoped - It ended up just going on and on and I ran out of energy. It just never ended! But anyway, because of the size it was always designed to use huge disk files. Because I used a lot of disk access the basic program ended up being surprisingly small. So anyway... Right from the start I decided to limit commends to one or two words only. The first thing that was checked is that more than one space did not exist in the command. I pulled it right up there so down the track I had some control. To start, every verb I could think of I put into maximum strings (stored in arrays), in a form like this; V$(A)="#GO-01#GET-12#JUMP-02#KILL-78#OPEN-15#LOOK-03#EAT-32#SWIM-17....etc " And I made the strings as long as possible. To confirm a verb was valid I would search for the term in the strings (I found this better than assigning every verb its own unique array value and searching for a match - especially as the number of verbs grew). The hash prevents finding partial words within other words as I always forced the search criteria by VERB$=HASH CHAR & COMMAND$. The "-" acted as a marker for the end of the word and the 2 digit number gave the verb a value. This value could then be inserted into inventory or objects to create the illusion of a huge response vocabulary . For instance you might say - "eat key". "eat" would be identified as having a value of 32 in this example. The key would have variables that confirmed things like if it was visible or hidden, if it was steel or plastic, would it burn, would it break, could it be eaten... etc. I stored these values in single strings which I read/wrote to files so the values were somewhat dynamic. "#12-455#03-322#01-122-#32-555.... etc". In the instance of EAT (32), I would search for #32. When/if found,I would then read the next 3 digits which referenced a disk record where the response could be retrieved. I found this worked very well, it was extremely easy to edit/add/change on the fly. This is a pretty quick overview of the method I was using. >YOU BEGIN EATING IT AND START TO CHOKE. YOU SELF HEIMLICH AND PUKE IT BACK UP. YOU DON'T FEEL VERY WELL"